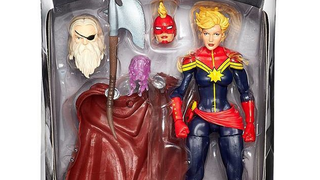 We saw some images of the figure when it was revealed at San Diego Comic Con earlier this year, but here it is in all its packaged glory: Carol Danvers' first Marvel Legends Infinite figure as Captain Marvel. Hooray! Carol makes her début in the Avengers Series Wave 1 of the Legends Infinite toys early next year, alongside Thor, Scarlet Witch, Hawkeye, Iron Fist, Machine Man and Sentry - with each figure coming with a piece of Allfather Odin to construct if you get all of them. But let's be real, although they're all lovely figures, everyone's really here for Carol. Although these are all comic-book-specific toys, presumably Hasbro will put this wave out before or around the release of Age of Ultron to capitalise on all that Avengers goodness going around. Think about it though, in a few more years time, you'll (hopefully) have a movie Captain Marvel to put next to this one on your shelf. Awesome! Check out package shots of the rest of the wave over at Marvel Toy News, then twiddle your thumbs until early next year while you wait for these beauties to arrive. Why does it take things so long to come out! ?